Pesto is possibly the king of simple sauces. Usually containing only 4-5 ingredients blended together, no cooking required, and good on everything, pesto deserves its popular status! 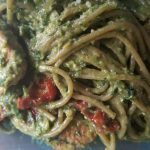 Unfortunately, in order to achieve the creamy, comforting style pesto that we sometimes want, it requires a LOT of oil and a LOT of cream! This recipe is inspired by my stepmother-in-law! She served this incredible pesto pasta and then shocked me with the news that despite being creamy and seemingly cheesy, it was completely vegan! I couldn’t remember half of the recipe that she gave me, so I improvised and added my own spin! This round, I decided to make a non-vegan variation because I wanted to add a complete protein, but I’ll definitely be trying this again without meat. You can also choose to use parmesan cheese instead of nutritional yeast if you aren’t vegan and prefer it! For those on 80 day, this meal comes with the bonus of having creamy avocado AND an option to have that cheesy flavour. You also don’t have to worry about limiting how much pesto you use as there is only 1 tsp of oil per serving! YUM! Alternative options for toppings include roasted red peppers, mushrooms, shrimp, cottage cheese, peas or chickpeas (for vegan protein), or turkey bacon. Enjoy!! Whether you make this vegan or not, this is a perfect comfort food! Combine the pasta water, avocado, basil, kale, garlic, lemon juice, nutritional yeast (or parmesan), red pepper flakes, salt and pepper in a blender or food processor until creamy. Add additional pasta water if needed in 1 tbsp amounts until you reach desired consistency. Heat the oil in a large skillet over medium high heat. Season the chicken with paprika (smoked if possible), salt, and pepper. Saute onions and chicken until about 2/3 of the way done, then stir in grape tomatoes until all are cooked through. 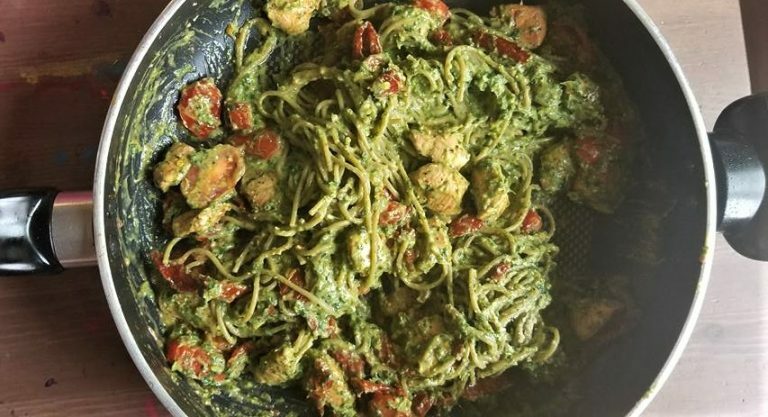 Combine pasta, avocado pesto, chicken, onions, tomatoes, and sun-dried tomatoes. 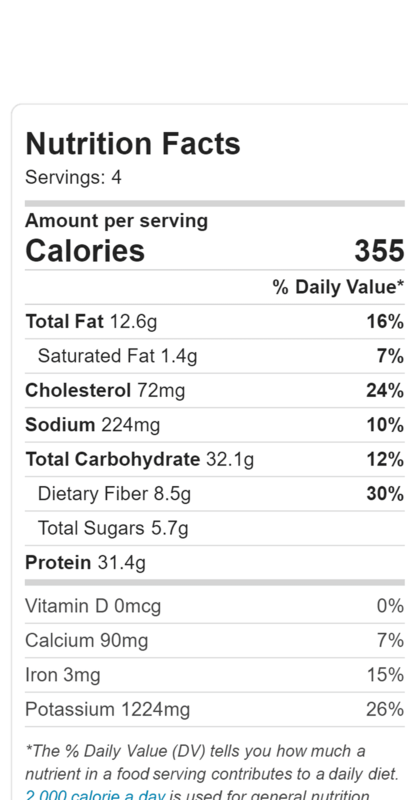 Will last up to 4 days in a sealed container in the fridge!